These directions assume you have a stand mixer (if not, grab a copy of Paley's Place to learn how to make the pasta by hand). Sift flour and a pinch of salt together; add it with the 5 egg yolks and 2 tbsp olive oil to the bowl of your stand mixer and fit it with the paddle attachment. Mix on the lowest (stir) speed until the mixture resembles a coarse meal, about 2 minutes. With the mixer still running, add the white wine about a tablespoon at a time until the mixture comes together to form a ball. Transfer the dough onto a floured, wooden board and knead 6-7 times. Let the dough rest, covered with a clean kitchen towel, for 30 minutes. (Pasta can be made in advanced, wrapped in plastic wrap, and frozen for up to 1 week. Bring to room temperature before using.) Divide the pasta dough into four pieces. Lightly flour the dough if it seems too moist or sticky while you are rolling it. 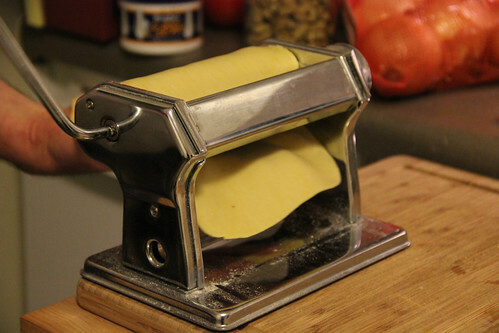 Start the pasta machine at its widest setting, and feed one of the pieces of dough through it. Fold the dough in half and repeat. Repeat this process, 10-15 times, until it feels smooth and satiny. (Remember to dust with flour if it becomes too sticky!) Begin narrowing the machine after each pass, until the pasta is the thickness you are looking for (about a #6). Each sheet should end at about 6 inches wide by 15 inches long (cut them to uniform size if necessary). Repeat the process with the remaining 3 pieces of dough. Combine the goat cheese, ricotta cheese, Parmesan, thyme, chives, and 3 tablespoons of the persillade in a bowl. Mix well. Cover and refrigerate. Lay the four pasta sheets out on a work surface lightly dusted with flour. Using a rounded spoon, mound a generous spoonful of the cheese mixture about 3 inches in from the left edge of one sheet. Flatten the filling while making a well in the center. Place the next spoonful 3 inches from the first, and the next 3 inches from that. Prepare the second sheet of pasta in the same way. Separate six of your eggs, one at a time, taking great care not to break the yolk. Carefully place each yolk in the middle of one of the mounds. Take the last egg and lightly beat it in a small bowl to use as your egg wash. 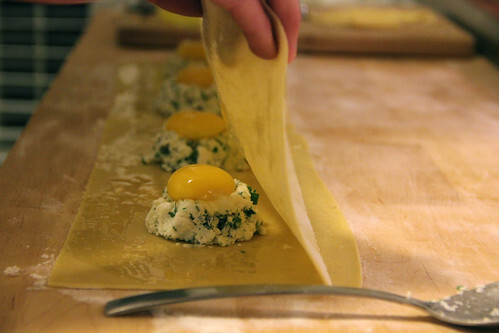 Completely brush a plain sheet of pasta with the egg wash. Carefully drape it, egg wash side down, over the prepared, filled pasta sheet, stretching it over the filling. Starting at the center of the sheet, carefully and gently press around each of the mounds, trying not to trap in any air bubbles. This will seal the filling in and glue the pasta sheets together. Ready a large platter, dusted with flour. Use a pasta roller to cut between the raviolis, leaving a 1-inch margin around each mound. Transfer to the prepared platter. Dust with flour, cover loosely with parchment paper and refrigerate. Trim the stems of the shiitakes and slice into ¼ inch-wide pieces. Place in a saucepan, cover with 4 cups of water and 1 tablespoon of salt. Bring to a boil over high heat. After the mixture comes to a boil, remove from heat and drain into a colander, reserving 1 cup of the cooking liquid and discarding the rest. Pat the mushrooms dry and lay them out on paper towels. Bring a large pot of well-salted water to boil over high heat while you continue with the next step. In a 12-inch skillet over medium heat, melt 3 tablespoons of butter. Add the morels and saute to warm through, about 3 minutes. Add the 1 cup of mushroom broth and the wine and continue to cook for 10 minutes, until almost dry. 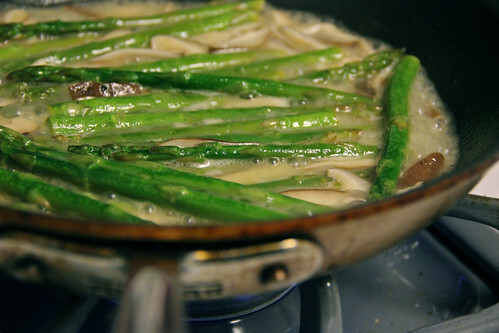 When the broth-wine mixture has been simmering for about 5 minutes (about halfway through its cook time), add the asparagus. After the 10 minutes have elapsed, add the remaining 3 tablespoons of butter and the remaining persillade and cook, stirring, until melted. Season with salt and pepper and keep warm. Gently brush the flour off of the ravioli and drop them gently into the boiling water. After the ravioli rise to the surface, continue to cook for 5 minutes until they're warmed through (the yolks will still be fairly runny). To serve, carefully remove the ravioli from the pot, one at at time, with a slotted spoon and place into individual pasta bowls (for hungry eaters like us, each person will get two — a standard serving is one raviolo per person). Top each mixture with a large spoonful of the asparagus mixture. Liberally sprinkle with additional parmesan cheese and a quick drizzle of balsamic vinegar. 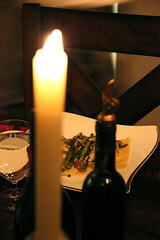 Enjoy immediately with a glass of Riesling or your favorite wine.